Ok, so we have gone a little CRAZY of Fidget Spinners here at Red Ted HQ. 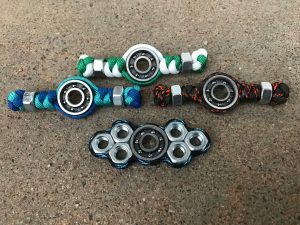 It all started with a “delayed” Fidget Spinner order.. and the belief of my children that I can make anything (hahahaha I have trained them well). 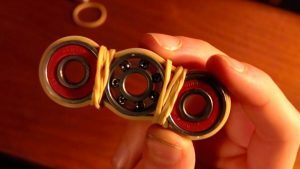 So last Friday, I shared with your a super simple DIY Fidget Spinner Without Bearings (because we had no bearings, and neither do most of my readers). 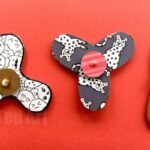 Over the weekend, we decided to make some more Easy Fidget Spinners – this time the “Tri Fidget Spinner” version. 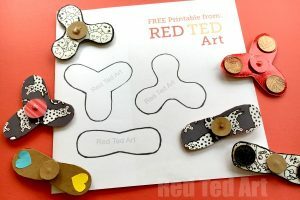 Yes, in essence they were/ are the same, but I added a free Fidget Spinner DIY template to that post to make life easier for you. 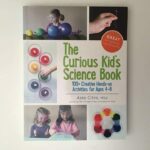 IT ALSO got me thinking about the SCIENCE of Fidget Spinners.. and how Fidgets Spinners make a great Science Fair Project! 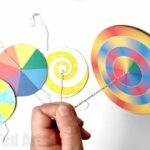 There are so many elements from Centrifugal Forces, to Frictions and Optics, even sound that you can investigate with figdet spinners (I talk about the Science of Fidget Spinners here)… it made me think.. you guys need a WHOLE SET of DIY Fidget Spinners – a round up of the best and hopefully easy Fidget Spinner DIY ideas out there.. so I pulled together this list. They are quite “wide an varied”. 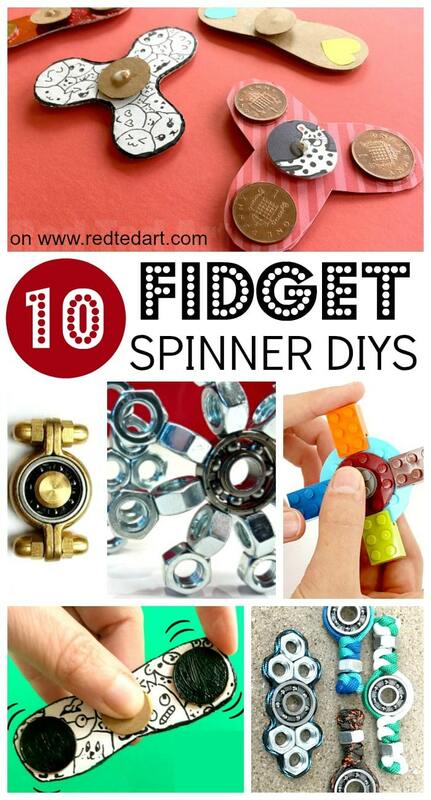 Personally my favourite are of course our own no bearing Fidget Spinners, but I also LOVE the LEGO Fidget Spinner DIYs. 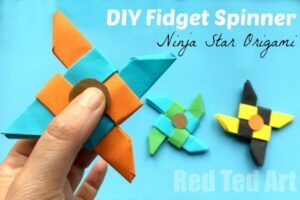 DIY Fidget Spinner Without Bearings – this is the simplest of all fidget spinners and perfect if working with groups of kids or if you need REALLY inexpensive and readily available materials! 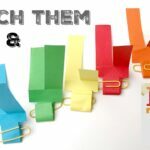 Here is another great idea… that replaces the coins with bolts – no glue needed! 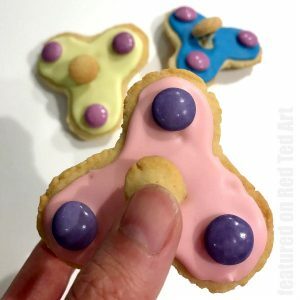 And these really take the biscuit – DIY Fidget Spinner Cookies, that REALLY spin. Too funny. 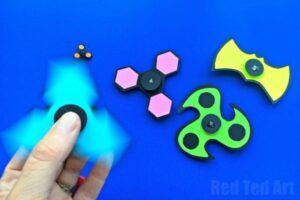 and Extreme Trends for info on more fun with LEGO Fidget Spinner DIYs!! 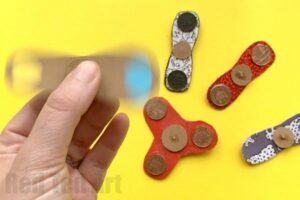 In fact there are quite a NUMBER of LEGO Fidget Spinner DIYs on YouTube.. hope over. 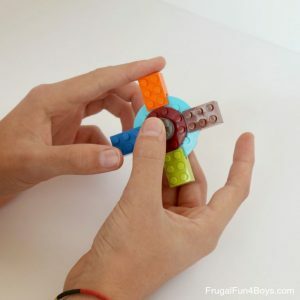 Search “DIY LEGO Fidget Spinners” and be prepared to get SUCKED IN!! ha. 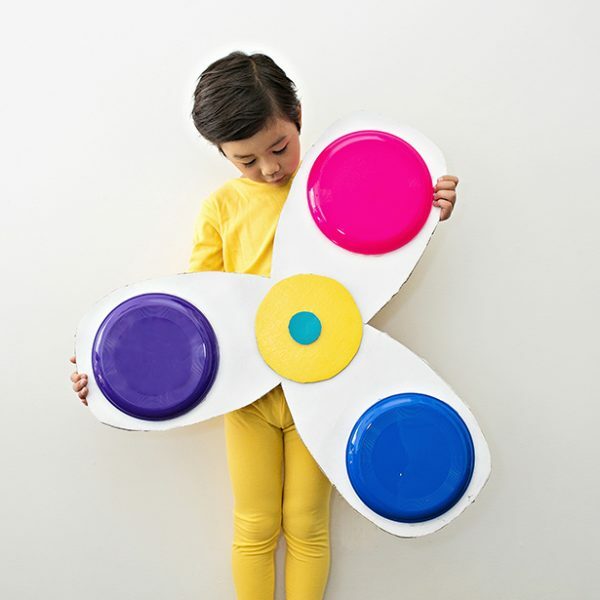 And yes.. if the DIY Fidget Spinner Craze is still going.. check out this cool Fidget Spinner Costume by Hello, Wonderful and be the envy of the naighbourhood! 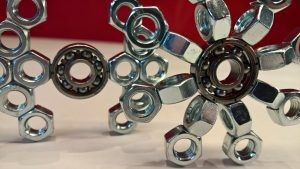 From old (clean) bike chain and key rings to cool Bike Chain Fidget Spinners! 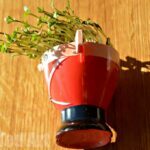 Another simple “duct tape version using, bottle caps and the same mechanism as for our cardboard spinners up above. 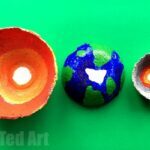 But wanted to share it as like this child’s innovation! 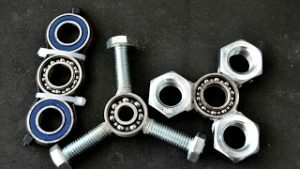 Now if you can get hold of some Ball Bearings (they can easily be purchased in here – US/ UK (aff links)) then all you need is some imagination to quickly and easily turn them into any kind of Ball bearing fidget spinner! 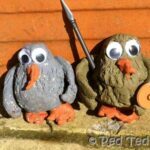 Ball Bearings are in actual fact not that expensive, but of course you have to get hold of some first! You then also need some seriously STRONG glue that will allow you to glue metal to metal. 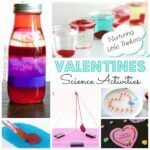 The methods share below would be fun for older kids to try out! 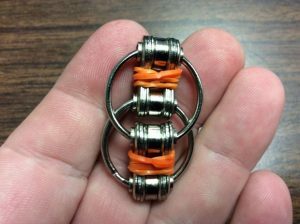 Another version of this Ball Bearings & Nuts Spinner! Isn’t that just super pretty?! 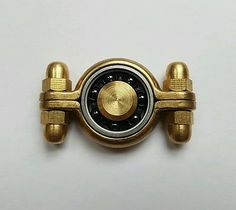 These mini fidget spinners are “super cute”. But I have no idea where you buy those close fitting nuts and bolts. Lovely though, eh? 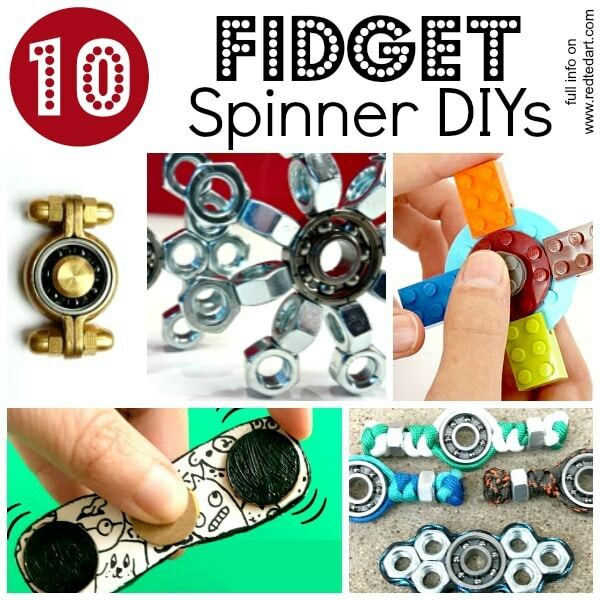 I hope you do feel inspired by this fantastic set of DIY Fidget Spinners and that you have a go… do check out the Science of Fidget Spinners post – which should give you lots of inspiration of how to turn these DIY Fidget Spinners into a cool Science Fair project! can you like post link for the template I’ve been here for ten minuted trying to find it. —–> Get your Free Fidget Spinners Templates here <——- Print this out in A4 format to get the dimensions right. If your local dimensions are different, make sure the settings result in a printed Fidget Spinner template that is 8.2cm (ish) for the dual spinner and 5.5cm (from tip to edge) for the Tri Spinner templates. These are sizes that my kids (9yrs and 7yrs) found easy to handle. i mite love it but i have to try it frist .